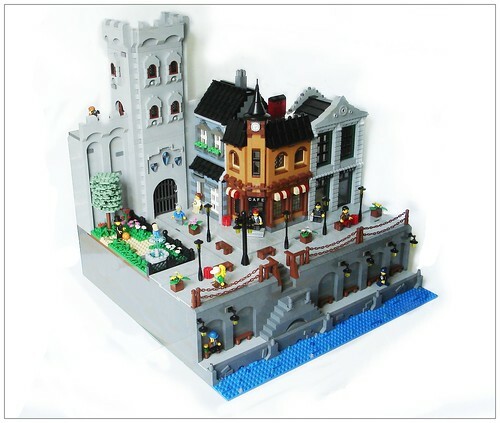 Brick Town Talk: Waterfront Wander - LEGO Town, Architecture, Building Tips, Inspiration Ideas, and more! Historic District - (BTT) All too often we focus on stunning buildings while failing to note their importance on the urban landscape, so it is a welcome sight to see the larger context now and again. An historic castle provides a grand backdrop to this promenade, complete with a park, cafe, a bank, and a townhouse - each impressive in their own right. Feel free to take the stairs down to the water, but do watch your step (and please, no diving).